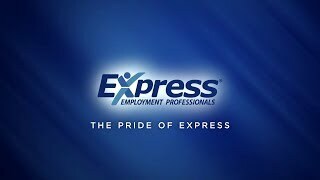 The Express Employment Professionals franchise in Clearwater, FL was purchased by Diane and Ken Frazer in October of 1996 and the office has grown steadily since then, continuously ranking as one of the top offices within the entire Express organization. Every day, we help job seekers find work and help businesses find qualified employees. As the largest privately-held staffing company in the United States, we're locally owned but globally powered ! Serving predominantly the Northwestern Central Florida Area, we are always looking for exceptional candidates who are looking for a new or better career. We have become known as a reliable resource for numerous businesses throughout our community. We get to know our clients individually through strong relationships and have come to understand their industries, challenges and skills sets. For local Employers, we evaluate the growing industry related to your business to conclude which requirements and skills are best suited for exceptional employees. We also spend ample amount of time working to understand your business goals to provide an effective "just in time" workforce. For our Associates, we go through a four-step process that allows us to capture all areas of an employee's skills, expertise, and capabilities. We then partner with their desired employment industry to find them the best temporary, short-term, or long-term job solution. We have become the leaders in the United States staffing industry by offering workforce solutions to Northwestern Central Florida Employers, including full-time and part-time employees, temporary staff, evaluation-hire staffing, flexible staffing, and short-term or long-term contract staffing over a variety of industries: Professional, Light Industrial, and Office Services. We also have a variety of jobs available, including full-time, part-time and temporary positions to fit your schedule and employment needs. Express Clearwater opened its doors in October of 1996 and looks forward continuing to serve the greater Pinellas County community for many more years to come. Since we are a locally owned franchise, we especially accentuate being a company that is small enough to give you the personal care and attention you deserve, with all of the backing of a large international corporation. Our ongoing educational opportunities, such as our free webinars and annual Leadership Simulcast are designed to provide relevant information to our clients. Our topics range from Employee Morale and Engagement, Conflict Management, Communicating With and Getting The Most From Your Employees - all FREE. Our Lunch 'N Learn programs can be done in your office and cover a variety of topics such as "How to be the Employee Your Employer Can't Live Without", "Generations in the Workforce", "Learn to Lead", as well as others - FREE. Since our humble beginnings as owners in 1996, our Express Office in Clearwater, FL has consistently ranked within the top 100 of ALL Express Offices; no small feat when you consider we have offices in virtually every major metropolitan area. From the number of clients we service, to the number of great people we’re helping return to the workforce, to our contributions to the organization, we have been the recipient of numerous awards. None of these awards would be possible without the hard work and extraordinary teamwork of our outstanding staff – ALL of whom have received their Certified Staffing Consultant certifications. Contact our Clearwater, FL office and meet with one of our Staffing Consultants for your hiring or employment solution today!